I began this series with my first entry Venerate Your Dead: The Americas while planning a menu for a Samhain Sabbat / Day of the Dead dinner party. Feel free to read that blog for a better intro. Cultures across the globe venerate their dead with elaborate festivals. Many fall immediately on or after Samhain, though it differs between hemispheres. Living in the US, I struggle to find any merit in our holidays. (WASP)Americans are without any real tradition to honour ancestors and I am continuously dismayed by the lack of openness regarding grief or speaking of death. In many Asian cultures, the recently departed are not considered dead, but rather in transition to the next life. Some believe they can summon the “dead” just by mentioning the person’s name. By continuing to venerate ancestors through ritual and tradition, loved ones can be kept alive, near, and dear. It was agonizing to choose only four Asian countries, and I am already working on an additional blog for others. Since most Asians are Buddhists/Taoists (or at least celebrate the traditions) and many veneration holidays are observed in similar fashion, my focus is on covering the basics and highlighting some rare gems. Here are the most captivating death and veneration rites that take place in Cambodia, China, Korea, and Japan. Cambodians celebrate Pchum (a gathering) Ben (ball, of something) somewhere near the end of September to early October, depending on the lunar calendar each year. They gather to honor their ancestors by offering food and gifts via Buddhist monks and to the monks themselves. It is tradition on Pchum Ben to make balls of rice and set them out at dawn to appease passing spirits, and to visit seven (but no less than three) separate pagodas. Pchum Ben origins predate even Buddhism; back to when people observed Animism, the belief that all creatures and objects, living otherwise, have a spirit. The first 14 days of this 15-day religious holiday are known as Kan Ben, the observation period of sacrifice and prayer. The final 15th day is known as Pchum Ben Day, where villages come together to cook, eat, drink, play, and dance together. Music and traditional arts take place throughout the entire period. Khmer people have a really beautiful way of cooking meals and making desserts by boiling dishes in bound banana leaves. Below is a video that shows how to make the traditional Num Ansom Chek (banana cakes) to celebrate Pchum Ben. This festival stands out in comparison to other remembrance rituals I have written about because in addition to giving offerings to ancestors, the Khmer people also give to offer solace and good karma to the spirits of victims of the Khmer Rouge when over a third of the population was brutally murdered not too long ago. Chinese culture is the epitome of Ancestor Veneration. The belief that ancestors become deities after death and should be worshiped is the core of Chinese religious and spiritual practices. Like many Asian countries, death and funeral rites draw from a combination of Buddhism and Taoism, with the addition of Confucianism in China. Filial Piety, a virtue of respect to elders, is also a fundamental part of Chinese culture. Burials and ceremonies are dictated by the deceased’s age, social rank, cause of death, and marital status. Older people are not permitted to show veneration toward younger people, and as a result, deceased young children are not allowed to be visited, prayed for, or kept in the home of their living elders. Quite devastatingly, in accordance with this custom, parents are not given any forum to mourn when their child dies and often the burial takes place secretly. Here is a more extensive look at Chinese death and funeral rites. At funerals there are very specific rules about what should be served to guest, each item with deep symbolism. It is customary to have a roasted pig, chicken, duck, jai (vegetarian dish), fruit, and rice. This article breaks it down a bit more and I found several tempting recipes. Click here for the Buddha’s Delight recipe above. Chinese people celebrate Qui Ye, also called Yu Lan or Hungry Ghost Festival, around the end of July (the Ghost Month), depending on how the lunar calendar lands each year. Like Pchum Ben, this festival originates in Animism but lasts for an entire month. The big party is saved for the fifteenth day known in English as Ghost Day, which must always fall on the Full Moon. Mourners burn incense and throw paper cut-outs of money, cars, jewelry as a symbolic blessing for their loved ones in the after life. 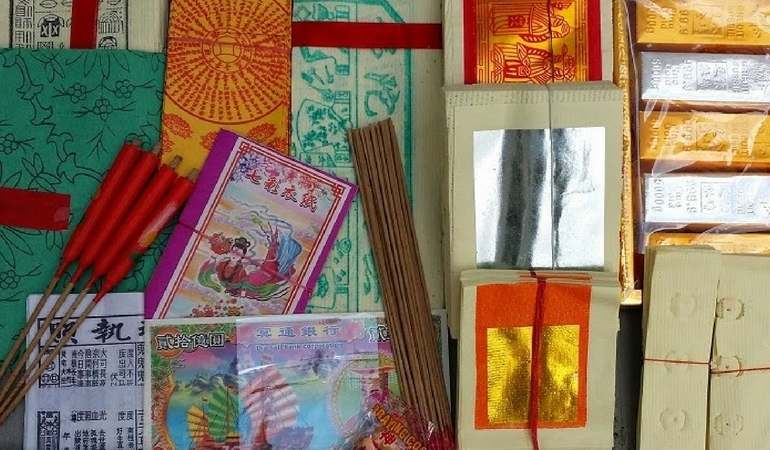 They also write messages on Joss paper and burn them in order to keep the spirits happy. Observing Buddhists and Taoists solemnly celebrate Yu Lan by setting paper lanterns aflame over water and watching them drift, and it is said that the longer it drifts before completely burning, the luckier the family will become. 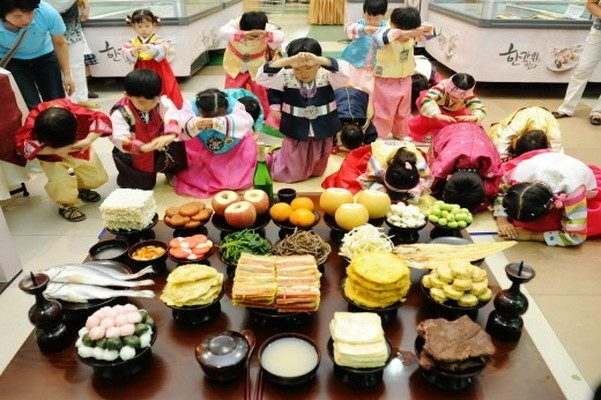 North and South Koreans celebrate Chuseok for three days near mid-September or early October depending on the lunar calendar, sharing many traditions with China’s Hungry Ghost festival. 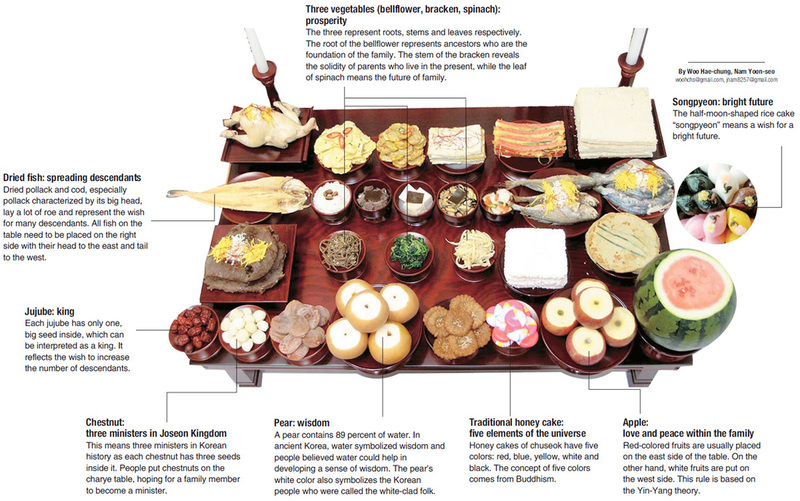 This is the largest Korean national holiday and is centered around food, comparable to the American Thanksgiving. 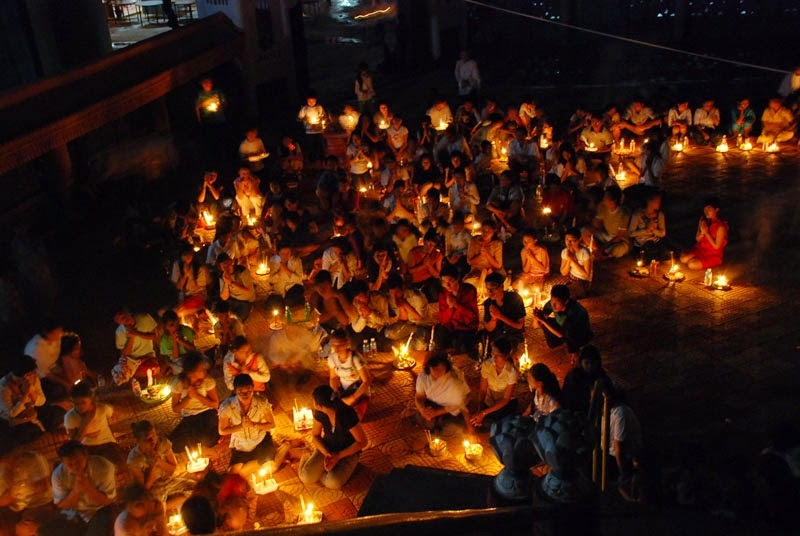 Jesa is a term for the ancestral veneration rituals that are observed at specific times through the year. The main rites are Gijesa (on the anniversay of the loved one’s passing), Sije (seasonal rites), Miyoje (ceremonies at the burial site), and Charye (mostly reserved for Chuseok). Charye is commonly observed by piling a low wooden table with fresh fruits and vegetables to celebrate the harvest season, as well as various dumplings and treats. Each family has their own special rituals and afterwards, they feast. Some of the staple dishes prepared for Chuseok are Bulgogi, Japchae, Jeon, a spread of Banchan, rice cakes, and cookies. 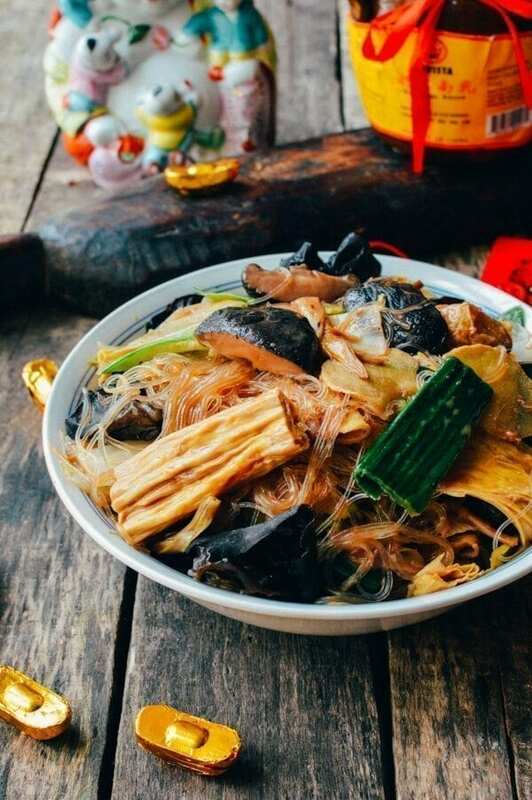 Japchae is another sweet-meat dish, but what makes this so special is the Glass Noodles made of sweet potato starch. Jeon are Korean savoury pancakes and can range from the simplicity of dipping sliced vegetables in a egg and flour batter to really fanciful and filling pancakes much like okonomiyaki. Most Koreans observe Chuseok by spending time with family in their home towns, going on vacations, and/or visiting graves of their ancestors. Japan’s Buddhist day of the dead festival, Obon, takes place in the summer, typically late July or August. On the first of three days, paper toro nagashi lanterns are lit and taken to cemetery to guide a family’s loved ones back to home in a ritual called mukae-bon. The lanterns are taken to the waters edge and sent adrift to send spirits back safely on the third day in a ritual called okuri-bon. Similar to other day of the dead festivals, families spend the day visiting and cleaning graves, returning to their home towns, catching up with relatives, and preparing an altar for food and offerings. Here it is known as the Shoryo-dana shelf. As an outsider, the Bon Odori traditional dancing with Japanese taiko drummers is the most fascinating part of festivities. These types of drums have been used in Asia and India since the 6th century or even earlier according to multiple archaeology findings. 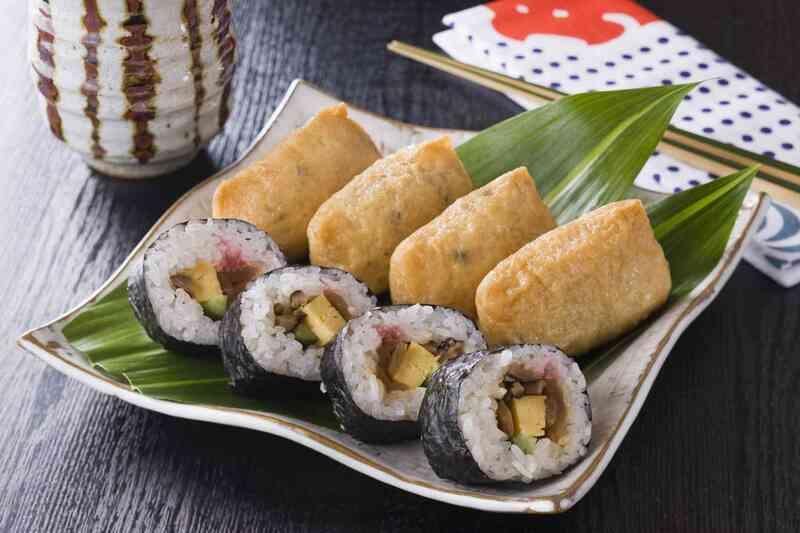 During Obon, the most popular foods served include Inari and Futomaki sushi, teriyaki chicken or beef, yakisoba, and chirashi. 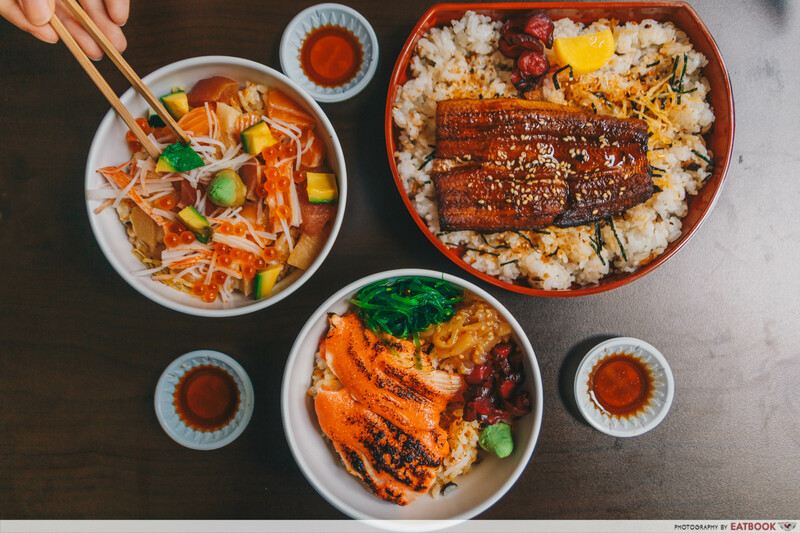 Chirashi is a type of “scattered rice” dish, one that would also be known as “deconstructed” in foodie terms. Try your hand with this recipe here. Forget about the cheap orange packages of dry noodle mix you can find in the grocery. Real Yakisoba is a delicious fried noodle dish that comes in endless variations like this spring vegetable Yakisoba recipe here. Death and Funeral rites in Japan can be exhausting and the cost is hyper-inflated. Japanese law does not allow intact bodies to be interred or buried, so the deceased are almost always placed in an expensive coffin long enough for visitors and then cremated, coffin and all. 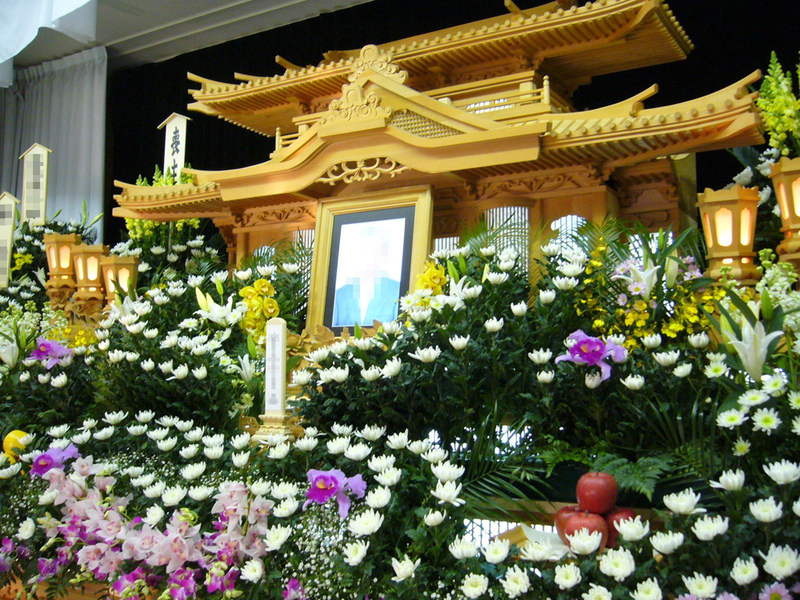 The Buddhist wake ceremony called Tsuya takes place once the body is returned to the home. Okiyome, the funeral meal, takes place after the burial and the family is expected to provide enough food for all guests who wish to attend, even if it is an entire village. Even if it drives them into debt and further despair. Silver and black envelopes of condolence money are given to the mourning family who, in return, gives a small gift to each visitor. Often, the family pays to have a new Buddhist name given to the deceased relative with the belief that it will prevent the person from coming back from the dead if his or her name is called. 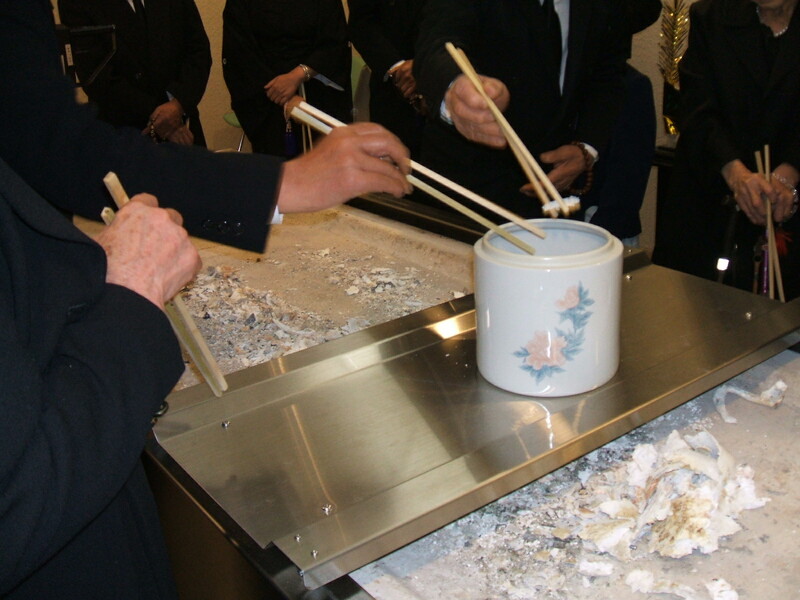 Fish is forbidden at funerals and in most cases it is customary to have a monk lead the tsuya with prayers over the deceased’s ashes. The family separates the bones from the ashes and places them in one or more urns, starting with bones of the feet and ending with the skull. Shukatsu is a term for the hordes of business people racing to jobs, but is increasingly used more as a slang term to prepare for death. Japan is considered a dying society, with more deaths than births each recent year. Because of laws and limited space, Japanese culture is brimming with creativity and innovation for exciting burial options. Endex, Japan’s Funeral and Cemetery Show, is an annual convention that provides education, counseling, demonstrations, and wild entertainment in order to expand Japan’s comfort and awareness in death positivity, final arrangements, and the afterlife. At the heart, Asian culture is based on respect and remembrance for lost loved ones. In the scriptures of the Theravada and Tirokudda Kanda, Buddhist concepts of offering food to hungry ghosts are offered to instruct the living in earning merit (aka karma). 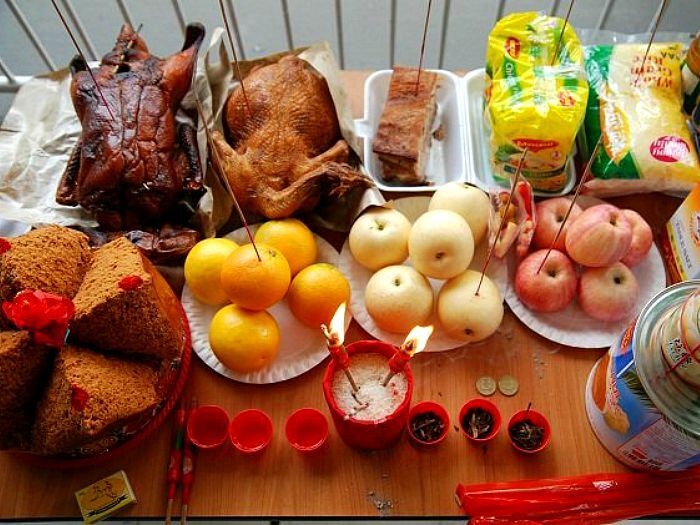 Each country has its own rituals that take place throughout the year but ancestor veneration is a part of daily life. In my current city we have a chapter of Death Cafe; a regular meet-up where people of all walks can discuss their fears, grief, death, final arrangements, and to seek help when needed. And they always serve cake. There has been huge progress in the US with Death Positivity in recent years, but Japan has it down pat. Thanks to Inelda, Death Doula courses, and other end-of-life planning specialists, the rest of the world is catching up. © Fernwehtun, 2015- Current. Unauthorized use and/or duplication of this material without express and written permission from this site’s author and/or owner is strictly prohibited. Excerpts and links may be used, provided that full and clear credit is given to Fernwehtun and Fernwehtun.com with appropriate and specific direction to the original content. © Copyright Fernwehtun, 2015- Current. Unauthorized use and/or duplication of this material without express and written permission from this site’s author and/or owner is strictly prohibited. Enter your email address to follow this blog and receive my new posts by email.